Getting employees on track to retire is a lot like herding kittens: everyone wants to go their own way, and it’s difficult to help lead them to where they need to go. Low participation, low deferral rates, and shortsighted investment decisions are three common hurdles that plan sponsors face. However, according to UCLA processor and Allianz behavioral economist Shlomo Benartzi, retirement plan success can be achieved more easily with a plan that alleviates the behavioral obstacles which cause these hurdles: inertia, loss aversion, and myopia. 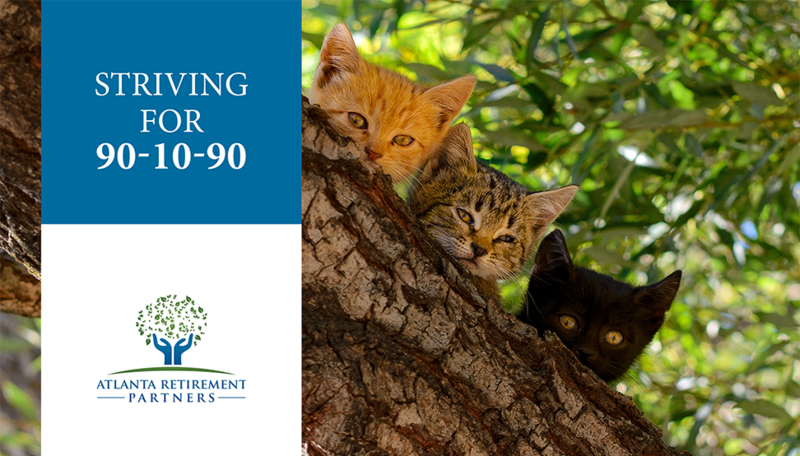 While there’s no one right way to help employees prepare for retirement, we present the “90-10-90 rule” as a guiding principle to help employers and participants alike overcome these hurdles. 90% participation– that’s the goal to strive for. If your plan suffers from low participation rates, there are a few clever plan design options you should consider taking advantage of. Plans that implement auto-enrollment show a marked improvement in participation rates; research from Vanguard shows plans with voluntary enrollment tapering off at 42%, while plans with auto-enrollment show participation rates of 91% – an increase of more than double! Of course, auto-enrollment is great for new hires, but what about your existing employees? Eight out of ten full-time employees have access to an employer-sponsored retirement plan, but only 64% participate in them.Consider re-enrollment or backsweeping to engage those existing employees who are currently missing out. Now that we’ve addressed participation, we can focus on how much your employees are saving. Most plans use a default deferral rate of 3%; while this is a good start, it may not be nearly enough to prepare your workforce for a comfortable retirement. By implementing automatic escalation, you can periodically increase deferral rates, typically by 1% each year, until participants reach a specific target rate. According to the 90-10-90 rule, that target rate should be 10%. Research shows 65% of employees enrolled in automatic annual increase programs choose to remain in them. Participants seem to be embracing these features. 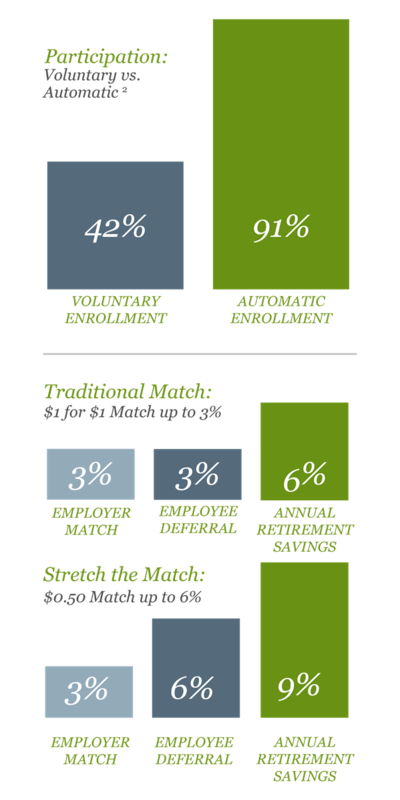 Another option to consider is changing your match formula to increase employee contribution without increasing costs. Many employees choose their savings paths based on what the company will match. Let’s examine a couple of matching formulas; to the right is an example of a traditional match as well as an example of a “stretched” formula. Myopia – “shortsightedness” – refers to the simple human tendency to focus on short-term goals instead of planning for the future. In this context, it means that people are more likely to aim for immediate gains rather than invest with retirement in mind. One way to encourage employees to invest their assets in appropriate vehicles for long-term retirement savings is by providing a qualified default investment alternative (QDIA). An astounding 96% of participants who are defaulted into QDIAs remain invested in that account selection instead of choosing their own investments. Again, there’s no one right way to help your employees prepare for retirement; however, considering advanced plan design options and setting goals such as the 90-10-90 rule is a great way to start. For more information on our retirement plan services and how we partner with plan sponsors to work towards increasing financial wellness and retirement outcomes, please contact us at: [email protected] or 404.814.0141. Vanguard, “Automatic Enrollment: The power of the default.” January 2015. Bureau of Labor Statistics "Employee Benefits in the United States." March 2015. Deloitte. “Annual Defined Contribution Benchmarking Survey.” 2015 Edition. “Getting Beyond Ordinary: Advances in Automatic Savings Program Design.” T. Rowe Price. February 2013.